Maybe the humidity and pollution are getting you in a frizz. We have many hair straightening options such as Chemical straightening, Japanese straightening and Hair Re-bonding. But are they the right solutions for your hair? Chemical Hair straightening is common practice in Bangkok salons, but what most fail to realize is there are now safer and better options to hair straightening. Many years ago we were the first to try Brazilian keratin in Bangkok, now we represent QOD the original pioneers of Brazilian Keratin treatments. This is one of the safest of Brazilian keratin brands and gives outstanding results, not to mention the latest technology means you no longer have to wait 48 hours to wash your hair. We will do it at the salon so you don’t have to, did we mention it also has 22k Gold nano particles and takes half the time to complete compared to re-bonding and Japanese straightening. But it wont last as long right? Typically Brazilian Keratin lasts 3-4 months, but whats great about it is it will gradually fade out and your hair has zero damage. Also with chemical straightening your natural hair will have grown after 4 months anyway, so again you would need another treatment. 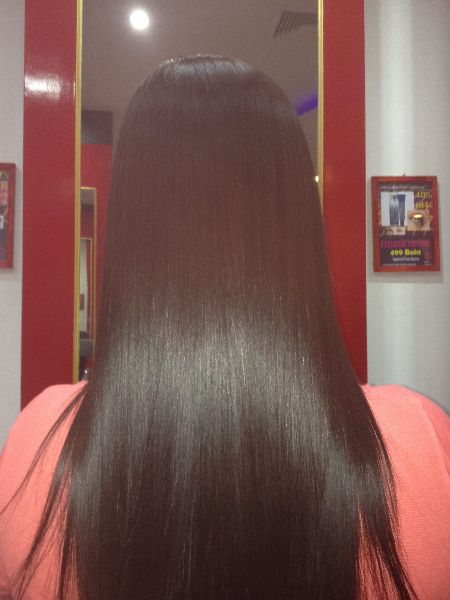 But each time you have Brazilian keratin zero damage occurs just silky shiny healthy hair. But each time you have Chemical Straightening the hair gets more and more damaged due to the molecular bonds being broken. Ofcourse for anyone who prefers chemical straightening we also have these and have carefully selected the best quality products from brands like Shisheido and swartzkopf. We have a fantastic New product that no one else in Thailand has, imported directly from Italy and the results are amazing. Permanent Chemical Straightening without damage, plus a treatment all in one. Leaving the hair straight and silky soft and healthy. Best of All the price costs no more than Japanese Straightening but the results are far better.